Another week with a lot of Ironman racing to cover. 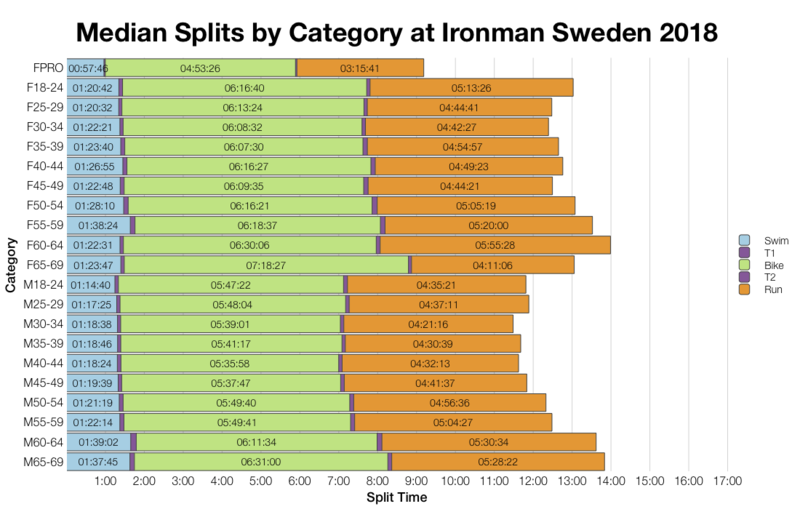 First up is Saturday’s race – Ironman Sweden. Now well established as part of the Ironman calendar Sweden is a fast race that draws a large field competing for 40 age group Kona slots. 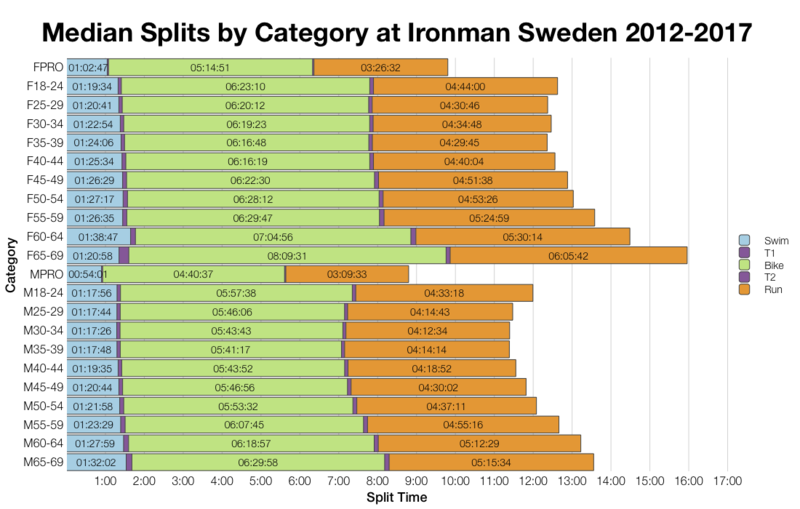 This year’s race looks to be comparable with previous years of racing in Kalmar. 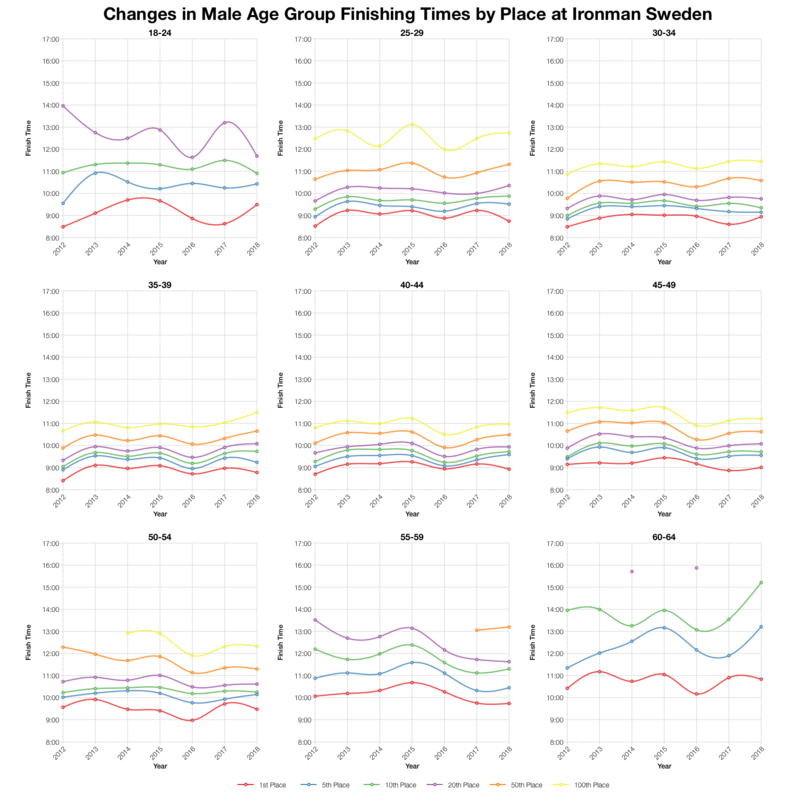 Although largely inline with previous years, this year’s race does trend slightly slower at the median thanks to a slower than normal run. 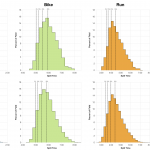 Swim and bike distributions are more closely comparable with the amalgamated results from the previous 6 years. 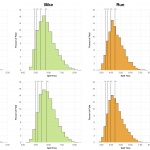 The run trends clearly slower and pulls down the overall distribution as a result. DNF rates at this year’s race tend towards the higher end for Sweden (allowing for the fact 2013-2016 include DNS numbers). Not the highest in any instance, but close across the board. 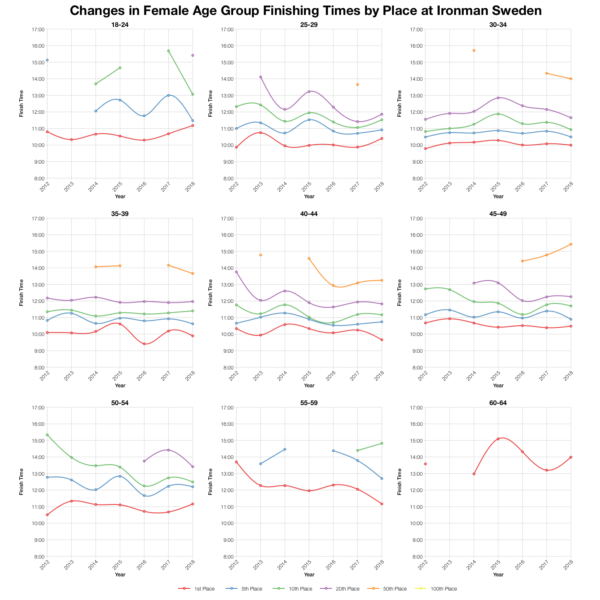 Looking at age group specific median splits shows the slower run times quite clearly. Swim and bike display more variation and no major pattern of change. 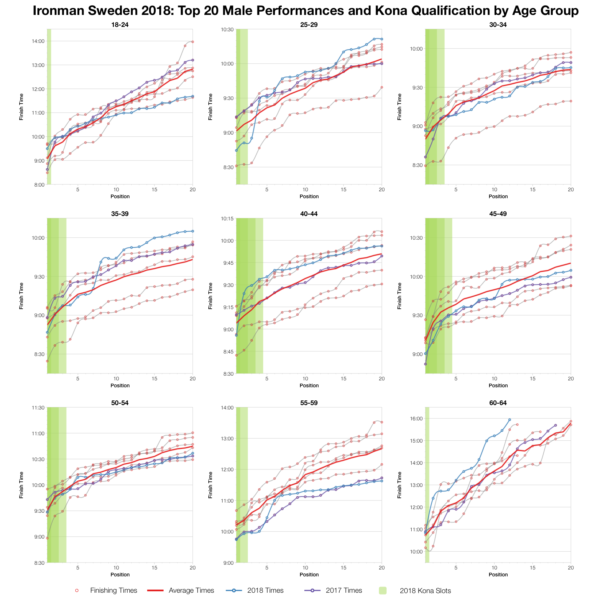 The vast majority of athletes are Swedish with the remainder coming from a very broad range of nationalities. Kona slots are claimed proportionally to numbers. 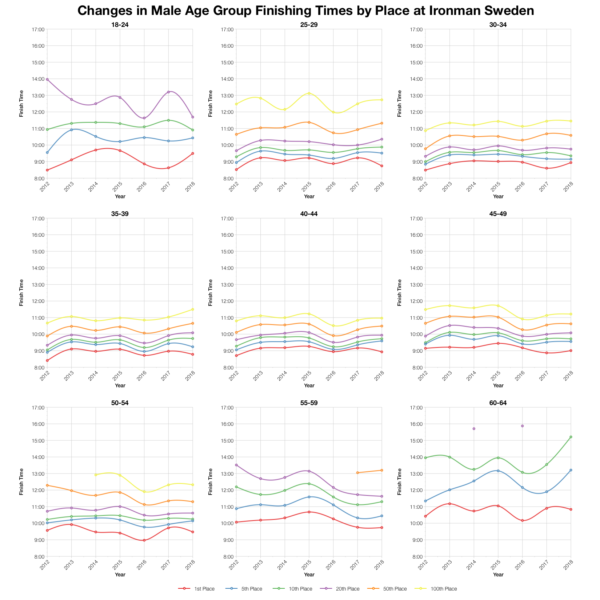 Tracking variation of specific age group placings shows that there’s no huge shift in times at this year’s race. The majority fall in line with previous years with a few showing slightly more deviation. Nothing is on the scale of the much slower 2015 race though. Based on the start numbers I’ve estimated the Kona slot allocation and from that the automatic qualification time. Actual numbers may have varied and roll down will influence final times. 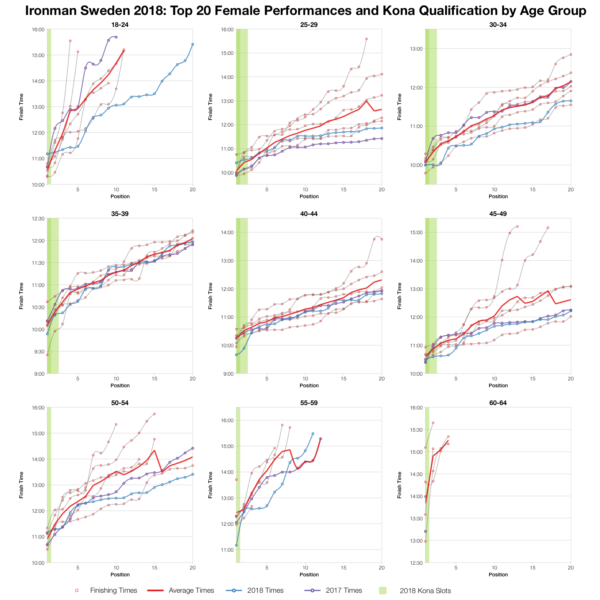 You can compare with other races on my Kona qualification page. 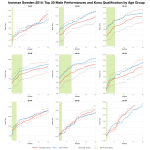 There’s quite a bit of variation across age groups in their top twenties with no clear pattern across them all. 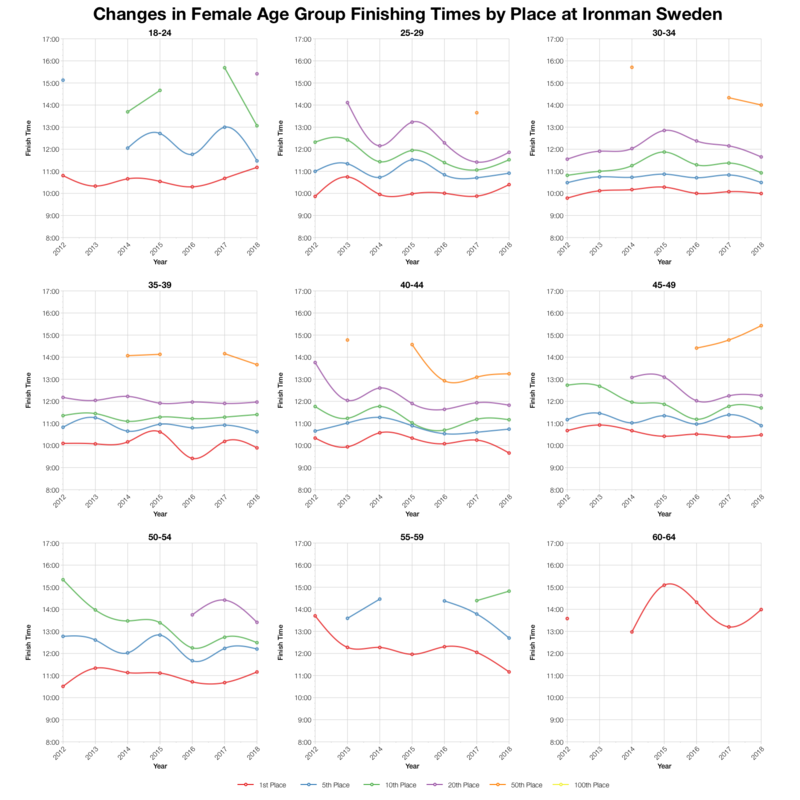 In the women’s age groups times tend to be average or faster for the course. For the men there are a number that are slower, but most tend towards the average or better at the very front. 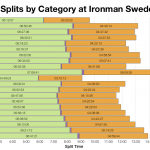 You can access a spreadsheet of the full results from Ironman Sweden 2018 on my Google Drive.